Above photo: Philippe Binder, professor of physics, (second from left) and colleague Ramon Figueroa-Centano, associate professor of mathematics (did not attend event), received the 2013 Koichi and Taniyo Taniguchi Award for Excellence and Innovation for their work on 3-dimensional visualization of complex mathematical objects at ‘Imiloa Astronomy Center planetarium. 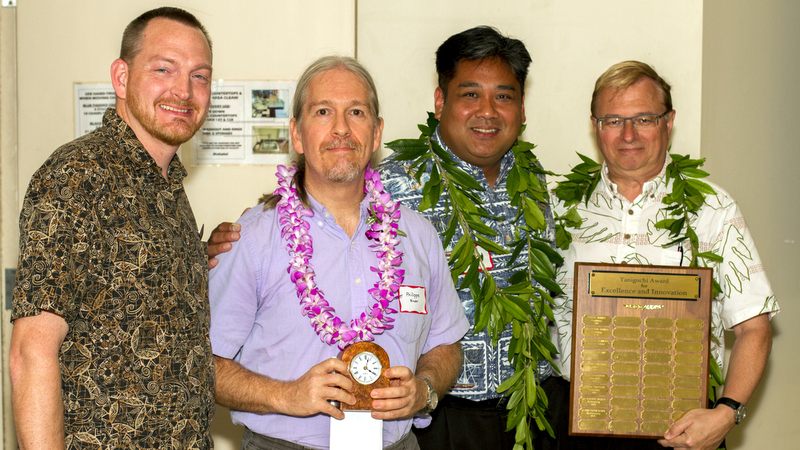 (l-r) Shawn Laatsch, who nominated the team for the award; Prof. Binder; Toby Taniguchi; and Chancellor Don Straney. Photo by Jaysen Niedermeyer. Themes of Professor Binder’s research have included time series analysis, the relation between chaos and theory of computation, and the study of siphons. 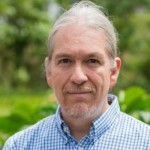 Philippe Binder is a professor of physics at the University of Hawai‘i at Hilo. His research interests include nonlinear dynamics, statistical mechanics, complex systems, time series analysis, theory of computation, biologically-inspired physics, and information processing by nonlinear systems. “The motivation for my research has always been to try to understand the world a little bit better by satisfying my own curiosity rather than to try to have a huge impact on my field,” he says. That said, when pressed, Binder cites two pieces of his research that do hold potential impact on his field. One resulted from work done around 1990 with Daan Frenkel in Amsterdam. The second piece of work was done at UH Hilo, and started as a term project for a course on chaos. “Every good piece of research should have at least an episode of trepidation followed by a moment in which things fall into place,” says Binder, citing two examples of his own work. In a project with colleague Brian Wissman, an associate professor from the UH Hilo mathematics department, the research team generated matrices that described the probabilities of obtaining certain combinations of measurements of a chaotic system when these were taken a certain time apart. The movie has been very well received at conference talks, as it has the power to surprise other people as well. It is also an online supplement to a paper Wissman and Binder published in 2010. The second example of a surprise in Binder’s work is more personal. A while ago, he was contacted by someone from France who had read a paper Binder published in a very visible journal. Binder stills work with this scientist, Prof. Antoine Danchin, and says the correspondence course in cell biology is still ongoing. “Unexpected collaborations can enrich a scientist’s life as much as anything,” says Binder. In work with Mark Kimura, a National Science Foundation-funded postdoctoral fellow, Binder has been studying computer models of the future of the island of Hawai‘i. “We are doing our work based on World3, the model that was used in the famous Limits to Growth book in the 1970’s,” he says. “While this work was controversial, we believe that the model is essentially sound and captures well the interactions between resources, human population and its activities, and the environment. Binder says he considers himself a non-programmatic researcher. While most of his work is in the broad areas of chaos and complex systems, he says he tends to pick a narrower theme, work on it for a few years, and move on. Recent themes have included time series analysis, the relation between chaos and theory of computation, and the study of siphons. Binder had some training in the liberal arts and in philosophical foundations of science during his graduate student and postdoctoral years, and says he has been fortunate to teach courses that emphasize the concepts and ideas underlying several areas of physics. In 2009, Prof. Binder received the UH Hilo Chancellor’s Award for Excellence in Scholarly/Creative Activities and in 2013 he received the Taniguchi Award for Excellence and Innovation. Philippe Binder received a bachelor of science in mechanical engineering with high distinction from the University of Virginia, a bachelor of science in astronomy from UH Hilo, a master of science in chemical engineering from the University of Pennsylvania , a master of arts in liberal arts from St. John’s College at Santa Fe, and a doctor of philosophy in applied physics from Yale. Published March 19, 2013; updated April 19, 2018.